Established in 1913 and originally named the Portland Section, the Oregon Section of the American Society of Civil Engineers (ASCE), has grown from 103 members to now over 1,900 total members as of May, 2005. This includes 270 Student Members, 59 Affiliates, 385 Associate Members, 1,096 Members, 88 Fellows, and 4 Honorary Members. In the Southwest Washington branch are 201 members, and the Capital Branch includes 131 members. For a nostalgic look at the section’s history, don’t forget to check the back issues of The Oregon Civil Engineer, dating back to 1965. See our list of all Past Presidents, dating back to 1911. Also, submissions of interesting history, including photographs, are welcome. Three historic bridges that have carried travelers across the Willamette River in Portland for nearly a century or more were honored today at a ceremony. The event included the unveiling of a plaque donated by the Oregon Section of the American Society of Civil Engineers (ASCE) recognizing the Broadway Bridge as a “century bridge” of historic significance to our community. Plaques have also been installed on the Hawthorne and Steel bridges, which recently celebrated their centennials. The ceremony at the Broadway Bridge included remarks by ASCE Oregon Section President Frank Sherkow, P.E., national ASCE President-Elect Greg DiLoreto, and Multnomah County Commissioner Deborah Kafoury. Broadway Bridge plaque dedication speakers: (from left) Frank Sherkow, P.E., ASCE Oregon Section President, Greg DiLoreto, P.E., ASCE National President-Elect, and Multnomah County Commissioner Deborah Kafoury. The three century bridges were selected by the board of directors of the ASCE Oregon Section. Other significant structures that the Oregon Section has honored in the past include the Columbia River Scenic Highway and the Oregon coast bridges designed by Conde McCullough. ASCE’s Oregon Section includes more than 2,000 members. The Broadway Bridge opened to the public on April 22, 1913. It is one of the only moveable bridges of its type in the world. The rare design includes a double-leaf bascule main channel draw span that uses massive Rall wheels to roll back counterweights when the bridge needs to open for oceangoing ships. The bridge has a distinctive brick red color to match nearby Union Station. A streetcar line crossed the bridge when it opened in 1913 and a new streetcar line will open across the bridge later this month, after an absence of many decades. The ASCE plaque is mounted on the southwest sidewalk of the bridge, where the NW Broadway ramp connects to the bridge. Multnomah County maintains the Broadway Bridge. The Hawthorne Bridge is the oldest working Willamette River bridge in Portland and possibly the oldest vertical lift bridge operating in the world. It opened to the public on December 19, 1910. 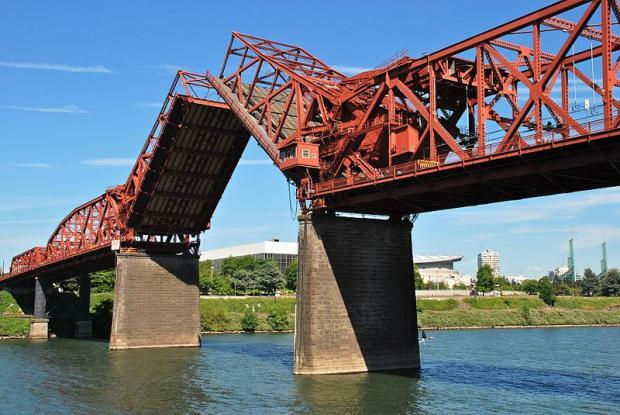 It is the lowest Willamette River bridge in Portland, just 49 feet above the river. Its drawbridge opens more than any other bridge in Portland. It carries 30,000 vehicles a day, including about 800 TriMet buses, and 8,000 bicyclists. The ASCE plaque is mounted by the bridge’s north sidewalk, east of the lift span, near the pedestrian signal. Multnomah County maintains the Hawthorne Bridge. The Steel Bridge opened on July 21, 1912. It replaced a swing-span bridge that was located about 700 feet downstream. It is the only double-deck vertical lift bridge of its type in the world. The lower deck of the lift span carries intercity trains and can be lifted independently into the trusses of the upper deck, which carries motor vehicles, TriMet MAX trains, and pedestrians. When large ships need to pass, both decks can be lifted together. A cantilevered sidewalk on the lower deck for bicyclists and pedestrians opened in 2001, as part of the Eastbank Esplanade. The ASCE plaque is mounted at the southwest corner of the Steel Bridge, facing the lower deck sidewalk. ASCE plaque at the Willamette Falls Locks. 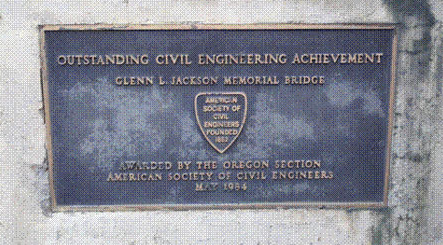 ASCE plaque at the Glen Jackson Bridge.